Have a look at some of the recent projects completed by Best Home Renovations. 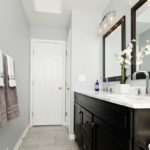 We transformed this dark and dated hall bathroom into a crisp and clean space. All fixtures and finishes were removed and replaced with fresh new contemporary fittings. If you are in need of remodeling services in Remodeling we can help, just give us a call at 630-868-3711, or fill out our online request form.